Sure, no one enjoys the task of writing checks but that doesn't mean you can't make it a little more gratifying with our Standard Checkbook Cover in full-grain leather. 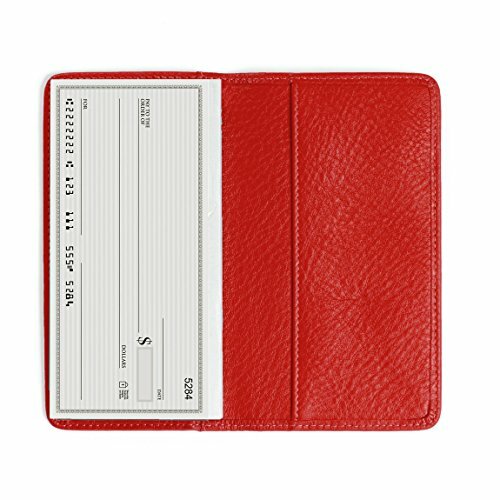 Tuck your checks in one pocket and your receipts in the other for a stylish and ergonomic update to that flimsy plastic checkbook cover your bank passes out. With soft full-grain leather in a variety of classic and current colors, you're able to distinguish between your checkbook and your spouse's (or that person next to you in line at the bank). For extra flair--or simply to stay more organized--add a monogram for yourself or buy a leather checkbook cover for that friend who has everything. Our Classico leather collection is a semi-aniline, drum dyed pebbled leather. It offers a little extra color and character, making it a good choice when you want your accessories to stand out. This full grain leather has a soft hand feel with intricate lines, giving it a distinct look from our smoother leathers like Vero and Zita. It comes in a wide variety of colors that you won't find in our other collections and has a polished finish to make them really shine. Its unique appearance and range of colors make it ideal for matching with purses, belts, or other leather items you own.